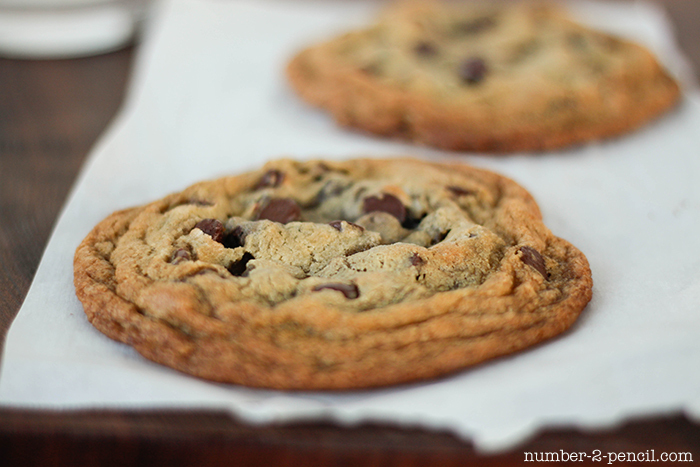 I have the absolute most perfect chocolate chip cookie recipe to share today. The best part is, it only makes two cookies. So you can indulge in these single serving cookies without having a huge batch sitting around to tempt you. They also whip up very quickly, and all in one small bowl. In a microwave safe bowl, heat butter just until it starts to melt and is softened. Blend softened butter, sugars, salt, and vanilla together by hand. Form cookie dough into two balls and place on baking sheet. The cookies will spread during baking, so make sure they are several inches apart. Bake for about 8 minutes, or until edges are golden brown. Remove baking sheet from oven and give the baking sheet a firm, but careful bang on the counter top. This will deflate the cookie and give it a perfect wrinkly appearance. Need a peanut butter fix? Try my recipe for just two peanut butter cookies. 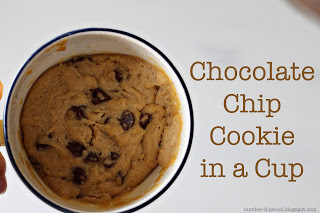 If you don’t have time for oven baked cookies, try my microwave recipe for Chocolate Chip Cookie in a Cup. It’s another perfect single serve dessert. Those cookies are kinda sorta perfect. I love having only two around (even though yes, I will eat both!). And they look so chewy and golden and gorgeous! Drooling. Love these! Pinned ’em to my single serving board on Pinterest. Nailed it, my friend! unbelievable! What a handy recipe to have around for those times when you really don’t want to eat an entire batch of cookies yourself. Thanks so much. The ingredients read “baking soda”, the instructions read “baking powder”. I used baking soda. Is that the correct one? Melissa do you happen to have the calorie count for this? I’m sorry, I don’t. 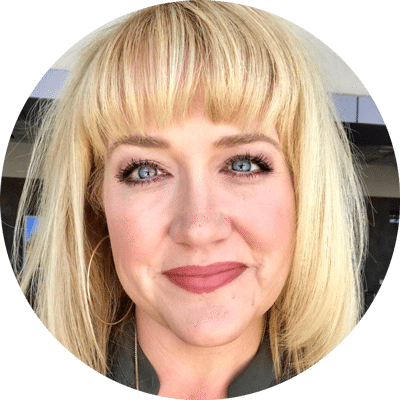 Maybe an online calorie calculator would work for you? I don’t know the calorie count, but I just ran it through the Weight Watchers Points Plus calculator and they are 12 PP+ each. Looks like 4 points per cookie. 8 for both. This is so fabulous. I am in Mammoth (high altitude in the Sierra mountains)…have any idea for adjustments? That’s a great question! I’m not sure about higher altitude baking, maybe somebody else can chime in? Just made these, and yes – perfect! I broke up a biscoff cookie and put it in the dough. cute…love the photos and I guess this is one way to make sure you only eat 2. Love the name of your blog as well. i read somewhere that egg WHITE is for binding, but you use egg YOLK in this recipe, why is that? i’m vegan so i’m automatically substituting things in my head as i read this, so depending on what the egg yolk is supposed to act as i would use a different substitute. example…for texture: applesauce or banana or etc, for binding: flaxseed or egg replacer powder or etc. i assume that since it’s the yolk its for the texture? It’s for texture and binding. Let me know how it goes! If I were to double the recipe for me and a friend could we use the full egg instead of two yolks? I doubled the recipe except I only used one yolk and they came out perfect. It made 7 cookies. I soaked a tablespoon of ground flax with 3 tablespoons of water for 5-10 mins, then used it as the egg yolk. Still came out amazing, and totally vegan. So delicious! Perfect late night sweet! I really really want the measurements for a whole batch of these but just couldn’t find it on your website. sooooo good :D:D I doubled it so my bf and I could have 2 cookies each for dessert! 🙂 thanks! Made these over the weekend. They were delicious! I always worry about single-serving recipes being too egg-heavy, since it’s hard to get a fraction of an egg, but this recipe has excellent balance. Definitely writing it down for repeat use. Thanks for sharing! I’m in loooooveeeeeeee with these but my middle is always not done (not even gooey) but my outsides are golden and crisp. How do I get the middle cooked without burning the outside? generally baking it a little longer at a slightly lower temp will help it bake more evenly without burning…. I always eat them with a fork because they are pretty gooey (in a good way). This is awesome. I have to try this out soon! 2 cookies is all you need sometimes. Thanks for sharing. Oh my goodness, this is the best thing EVER. Brilliant! using the recipe builder on http://www.myfitnesspal.com, i found that the 2 cookies are approx 715 calories total. are these cookies relatively large? Yes, they are good sized. yum! love this idea..darling blog! omg, tooo cute! must make! thanks for the recipe! Haha, it would have to be selfish treat, since my family usually eats up all of my bakes! Thank you for the recipe! ^^ They look like gorgeous cookies! My dough was incredibly gooey, there is no way I could form it into balls. I added 2 Tbs of flour but then they baked up really cakey. Any suggestions? The dough is a pretty wet dough, which makes for a thin cookie. You can use damp hands to roll to prevent sticking or refrigerate your dough for a few minutes to make it easier to handle. Be sure you’re mixing by hand and then don’t over-mix. Even that can make a huge difference. this is such a genius idea. thanks for this fabulous post! Made these today, they were perfect. Thanks for the fabulous recipe! Is there a way to convert this to grams? 2 cookies!? ANY TIME WE WANT??? YOU’VE DOOMED US ALL!!! Brilliant! Thank you for sharing this. So yummy! Thank you for your recipe! I found it through a friend’s pin on Pinterest and made them that very night. I swapped light brown sugar for the dark and used mini chocolate chips. 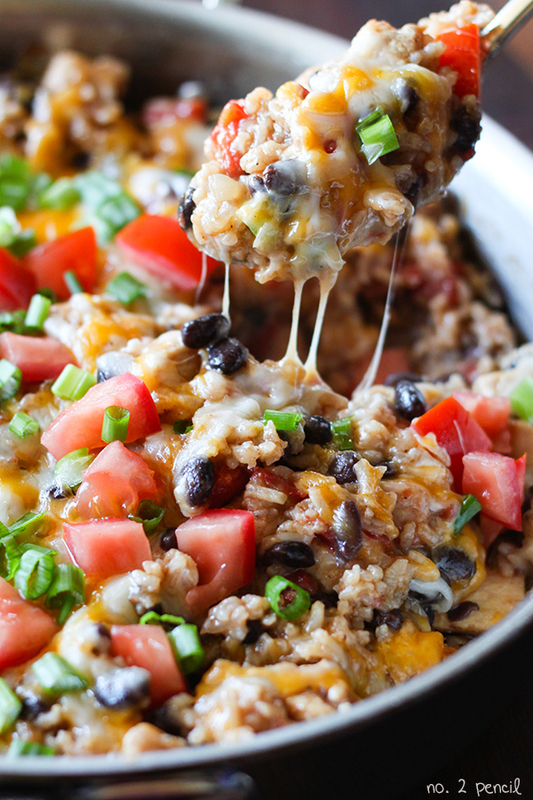 Just as yummy and easy to whip up! Thanks again! you wicked thing! i was safe until now. i could barely finish reading your recipe because i was fighting the urge to go to the kitchen and make the cookies. I’ve probably made these half a dozen times since I first found it on Pinterest! I use sucanat for the brown sugar, evaporated cane sugar for the white sugar, and whole wheat flour for the flour. You can’t tell they’re “healthier”! I just love them. I usually make four-six smaller cookies and bake them for 7 minutes. Perfection! These are awesome! Perfect for me and LO when we want a treat during the day. Hi I’m just wondering if the ingredients are correct when it says 1 tablespoon salt? Or is it 1 teaspoon? I am loving your single size serving posts; great idea! What a great idea, this is perfect for me because I have no self-control when it comes to cookies! I tried these and reviewed them on my blog. They are absolutely perfect! So incredibly delicious and I gave them 5 out of 5 stars. And hey now, I don’t give gold stars out all willy-nilly either :). Thanks for sharing a delicious and easy recipe that is portion-controlled for those of us with “snarf-down-the-entire-batch” tendencies. Beth, you are so kind! Thank you a million times over! fabulous – then you aren’t tempted by the other 11 cookies! These are in the oven now — the dough is AMAZING. And they made 4 normal-sized cookies for me! I was expecting “blog cookies” (you know, the blogs where the desserts are OMGsofilling and then when you try to make them the cookies are the size of a pencil eraser?) Can’t wait to enjoy these, thanks for this! Thanks for sharing this! They’re in the oven now. The dough tasted delicious and it made 4 regular sized cookies for me — when you said 2 cookies I was expecting teeny tiny cookies. Thanks for actually MEANING 2 big cookies! WOO HOO! I cant wait to try it!! I love that it’s make only two 🙂 perfect for the ones who live alone! I made these last night. Love them! I am sitting at work thinking about the half of a cookie I have left at home. Thanks for posting this. I love this recipe!! I always use it for my cookie skillet for hubby and I to share!! It is the PERFECT amount without baking over the skillet ❤ this needs to stay here forever!! YUM. these were fantastic. I ended up melting the butter completely by mistake and the dough wasn’t really dough, but they still baked up well!!!! These are absolutely delicious!! I love these single serving recipes as well, I would love to see some more!! For your readers who must eat gluten free, I made these with a substitution of 1/4 Cup Authentic Foods MultiBlend GF flour in place of the 1/4 cup all purpose white (wheat) flour. I also added a handful of chopped pecans, out of personal preference. Delicious cookies! I followed the recipe exactly, and it’s in the oven now baking. I can’t wait to try it! Can I use regular salt instead of kosher? I, literally, have been searching for this recipe….for years! These taste super similar to a certain famous mall cookie maker that I am obsessed with! But these are way better, cuz they are flat and chewy and glorious! (And homemade!) the only problem is…they are too easy to make lol. I just ate both myself! I made these cookies last night and totally loved them. I also didn’t expect for them to come out so big. Thank you for sharing! 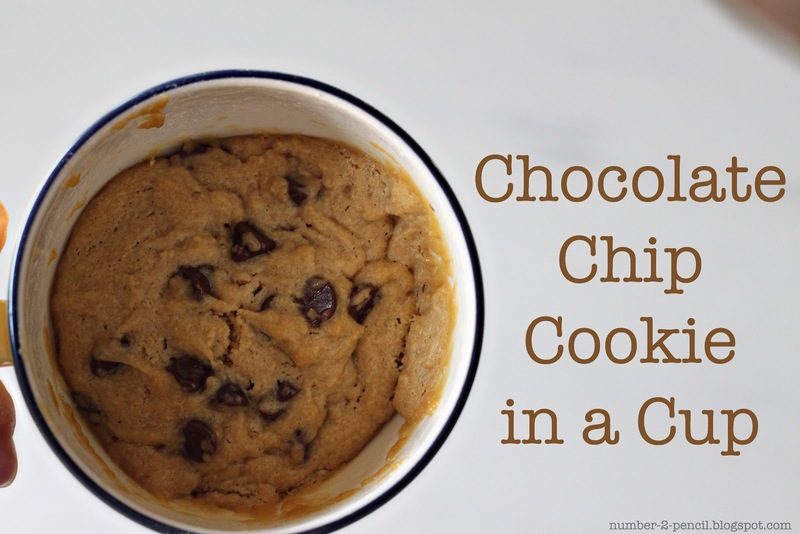 Sans the egg yolk, it is also a perfect recipe for when you crave a couple bites of cookie dough. Yum. I put the dough into a 1-cup Pyrex bowl and baked it for 25 minutes – it was exactly what I was looking for – slightly crisp and browned around the outside, warm and gooey in the middle. I was in heaven. Oh too tempting. 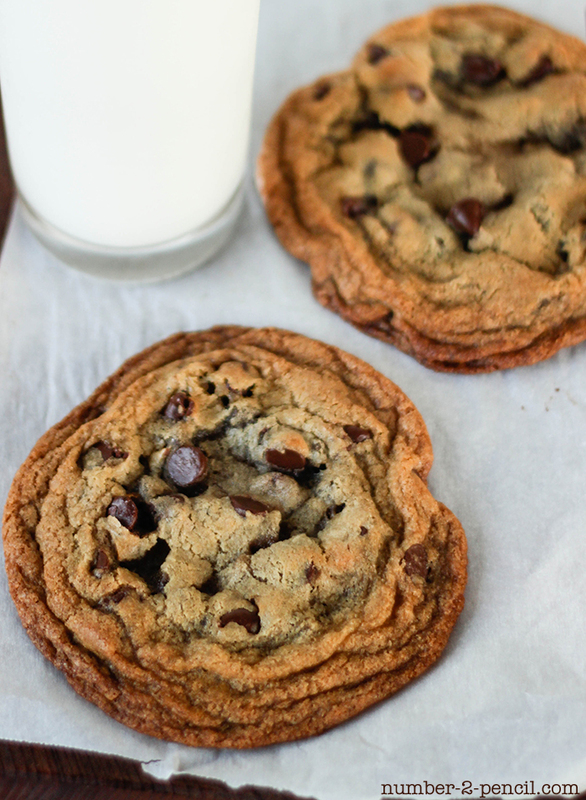 Freshly baked cookies for two every night? My husband would marry me all over again. I have an egg allergy so I added two measured tablespoons of 2% plain greek yogurt and they came out great. It did take longer then 8 minutes to bake but I followed the directions and kept watching for the edges to turn golden. BTW, I have used yogurt or buttermilk in the past as an egg substitute. These are delicious and I don’t taste any difference using a substitute for the egg. Half of a cookie was perfect to address the craving I had. These are delish. I love these. The last two times I have made these, I have not had chocolate chips in the house, so I’ve replaced 1 tablespoon of the flour with 1 tablespoon of hershey’s special dark unsweetened cocoa. Made fabulous chocolate cookies. And an extra crunch of sea salt on top? HEAVEN! For those who are out of eggs, 1/2 tbls flax meal with 1/2 tbls of milk worked really well as an egg replacer. I normally do 1 part flax for 3 parts liquid, but I just realized I used the wrong measuring spoon and did equal parts of both. Anyhow – it worked better than I thought it would. Thanks so much for that substitution – I just ran out of eggs! This was amazing! I made it into one large cookie that me, my partner, and our little one shared. I patted the dough into a 3/4-inch thick round before baking. It was perfect for our sweet craving and there are no more cookies laying around for us to get fat on. Thank you! This is my favorite “I need a quick sweet fix” recipe! Have recommended it many, many times! omg this recipe is seriously perfect. I’ve tried other single serving dessert recipes and they were atrocious. Thank you!!! Made these last night and they were fabulous! I wanted enough for today so I did double the recipe and used one whole egg instead of just yokes, we both thought they were great…. Thanks for the awesome recipe!!! Thanks for the fabulous recipe. I doubled it last night in order to splurge again today using the whole egg instead of just yolks, they came out great. Thank you for an amazing, simple recipe! I was really skeptical about this recipe, but it was fantastic! It’s a dangerous one to have being so quick and easy and yummy! These are so tasty! I sprinkles smoked salt on top, yummy! Thanks for the great recipe. After having my hopes dashed with other recipes, I was prepared to be underwhelmed when I made these cookies. I’m happy to report,however, that I was totally overwhelmed! They were SOOOO GOOD! DELICIOUS! I was so excited that I posted on Facebook with a link to this recipe (and I’ve never done that link thing before, LOL!) THANK YOU THANK YOU THANK YOU! So I haven’t ever made it to the baking stage with these but the cookie dough is delicious and the portion control is FABULOUS! thanks for this. I am making this recipe for the second time right now – so good! I used a toaster oven so I didn’t have to heat up the big oven for two cookies, and after reading a few reviews about gooey middles I ended up fiddling with the cooking time/temp a bit. I baked mine for 12 min on 350, and the edges looked golden but the centers still looked wet so I lowered the temp to 300 and baked for another 3 minutes then let them sit on the pan for a few minutes. Perfect. I’ll be trying these with gluten free all purpose flour! You are a genius. Perfect for after school snacky treat when parents have self-control issues. I have made these cookies more than once and they come out perfectly each time. This recipe is a keeper for sure!! This recipe is perfect for my little cast iron skillet! It takes a few minutes longer to bake, and I just wait until the top is golden but the inside is still a little bit gooey. Then I put vanilla ice cream on top and eat it out of the pan! It’s the perfect dessert! I made these yesterday. I loved them! Thanks so much for this quick recipe! Sooo good! I had some leftover browned butter from dinner earlier and used it in these (cooked it in my little toaster oven). YUM!! I have made these cookies before and they are perfect. I was going to make them again today and realized I have no butter. Do you know a good substitute that I could use? Two cookies? Ha! I add two fistfuls of pecans, chopped, and come out with six BIG cookies. I also cook them at the “traditional” temp for chocolate chip cookies of 375, for 13 minutes. They are fantastic. I never make a full or even half batch anymore. These are so quick and delicious! These are in the oven as I type this and I’m so glad I remembered this recipe. I was craving cookies earlier but decided not to make them since I didn’t want or need a whole batch. Then remembered this recipe, so thanks!! These things tasted amazing! Even though I used cake flour and baking powder instead of all-purpose-flour and baking soda. They turned out amazing. A bit burnt (because my toaster oven doesn’t have the temp thingies), but amazing nonetheless. The dough was really hard to form into a ball though. I don’t know if it was because I substituted ingredients, but I ended up just scooping them up using a spoon and placing them on a baking sheet. haha Thank you for this recipe! Made these cookies and it was aweeeesomeeee! A little gooey in the middle so I had to bake it for a few more minutes but was perfect otherwise. I’m already planning to make another batch as soon as I buy another bag of choc chips! 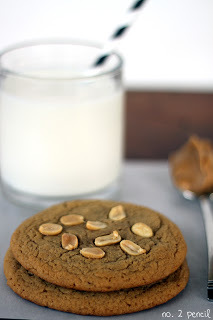 I added 1T of peanut butter to this recipe and made ‘regular’ sized cookies from it. I got 6 amazing cookies out of it! I forgot to add that I made these gluten free and they came out perfectly. I used *almost* 1/4C of GF flour, 1T almond flour and 1T coconut flour. Delicious! I still love these cookies. First made these “small batch” CCCs in May. I indicated I cook them at the more typical 375F, but now I squash them down before they go in the oven and cook them for 11 minutes, like “normal” size CCCs. If you make big cookies (with chopped pecans) and do not squash them down, they need closer to 13 minutes. This looks awesome! I definitely want to experience quickly making one chocolate chip cookie, without worrying about the hassle of clean up. I have mentioned some of your single serving recipes in my blog Food for Your Noodle (https://foodforyournoodle.wordpress.com/), and they were super helpful in providing college students with quick, delicious desserts! These were absolutely wonderful! My dough was not stiff enough to make into a ball, but it didn’t make any difference. My husband said if you could come up with an oatmeal raisin that would really be good! Yep – these are stellar. I only used 2 T of chocolate chips and I sprinkled a teensy bit of salt on top. Also I had to bake mine for 11 min. So good. 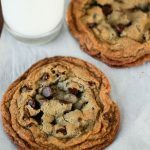 Wonderful…I teach cooking to high school students and adapted your recipe with the steps for the Perfect Chocolate Chip Cookie recipe from Cook’s Illustrated. I browned the butter and poured into a bowl with another tsp of butter. I mixed in the sugars, salt, vanilla, and egg. Then, I whisked for 30 secs and waited for 2 min. 3 times. Finally, added flour, soda, and chips. The extra steps provide a more caramel flavor and improves texture. Thanks again for the recipe. It’s pinned on my iphone. Just made these cookies, but doubled the batch (I love cookies lol) and left out a tablespoon of chocolate chips since I already made chocolate chip banana nice cream earlier today (2 frozen bananas, 3 tablespoons chocolate chips, equal parts milk/heavy cream- enough to blend smoothly). They came out wonderfully!!! Such a great recipe and I love that you need minimal measuring spoons/dishes for a quick and easy clean up! My doubled batch recipe made 5 large cookies, almost the size of a large hand. delicious! i want to use this recipe as a gift, canned in a jar, what size jar do you think is best? I have made this recipe over and over and over. It’s awesome. I cut back on the sugar by only adding the 2 tablespoons of brown sugar, but I like things less sweet. They come out beautifully. Thanks for the recipe! i made this cookies several times and all of them turned out delicious! but i wonder why i cant get the wrinkled cookies? the first time i baked them, they were perfect and wrinkled, but the next time i made them, they turned out smooth and soft (yet stiil delicious). i’ve been following the recipe and made it many times but still can’t get the wrinkled like the first time. can you help me? I made this tonight. Cookies NEVER work for me, but these were amazingly good! YUMMMM! I’ll make these again and again! Thanks again for such a great recipe! Oh my goodness. Perfection! Ended up doubling this recipe & making more, which totally defeats the purpose of you going through all the trouble finding the perfect measurements. But I couldn’t help it! So tasty! These were actually really delicious and so easy to make with ingredients everyone has on hand. I love how effortless it was! Thanks for the genius recipe! I make this recipe like once a week! 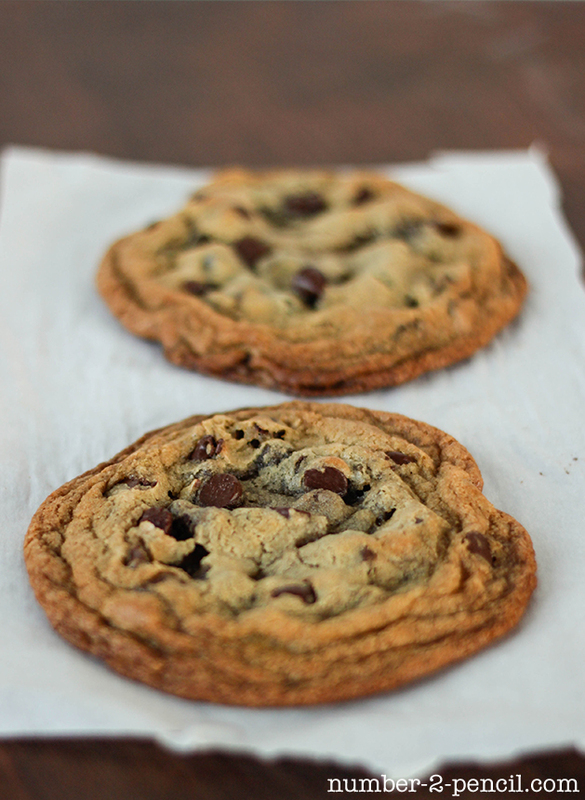 It’s my go-to treat, hands down the best chocolate chip cookie I’ve ever made. I just made these!! Omg, they are rich and gooey!! Thank you. I will try the peanut butter for 2 next!! By far my favorite cookies. I love this recipe so so much! Making it the 4th time since you released the recipe. Oh.my.gosh. this hit the spot. I wasnt comfortable with the 1-2 serving size so I doubled just to be sure I got 2….well I got 4 large cookies! I didn’t have any chocolate chips so I used up some leftover mini reese’s pumpkins from Halloween, ha! There’s so many possibilities here. Awesome recipe!